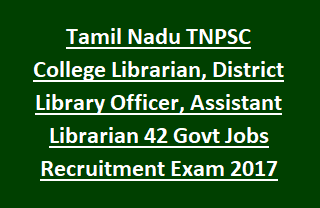 TNPSC Librarian Jobs Recruitment Exam 2017: Tamil Nadu Public Service Commission released a latest notification for recruiting the available vacancies of College Librarian, District Library Officer and Assistant Librarian Jobs on regular basis in Tamil Nadu College Educational Services. There are total 42 vacancies in this TNPSC latest recruitment 2017 notification. Online applications for this TNPSC College Librarian jobs will be available from 21-11-2017 to 20-12-2017. Written exam and interview will be conducted for this TNPSC College Librarian, Library Officer jobs. Online applications are only available for this TNPSC Recruitment 2017 of Librarian jobs through the official website of TNPSC.gov.in. TNPSC Recruitment Latest notification for College Librarian and District Library Officer Jobs exam pattern, syllabus, application procedure and other details are given below. Exam fee is Rs.200/- for General candidates and for other no fees. There are total 42 vacancies in this TNPSC Latest Recruitment Notification 2017. Post Name and number of vacancies are given below. As on 01-07-2017 for upper age limit for District Library Officer and College Librarian is 35 years and for Assistant Librarian jobs upper age limit is 30 years for General candidates. For other no age limit. Candidates will be selected through written test of objective type and interview. Written exam will consists of two papers. Paper 1- LIBRARY AND INFORMATION SCIENCE. Paper 1 Exam duration is 3 hours. Total 200 questions will be given. Each questions carries 1.5 marks. Maximum marks for Paper 1 is 300. Exam Syllabus for Paper 1 will be Post Graduation level. Paper 2 syllabus will be degree standard for General Studies and for Aptitude and Metal Ability questions SSLC level. Interested candidates can submit their application form online only through the official website of TNPSC @tnspc.gov.in. Last date for online form submission is 20-12-2017.